Available wherever the patient considers home, including a residence, skilled nursing facility or assisted living community. In case that the patient's health dramatically declines and needs close medical attention, OpusCare staff can provide continuous care in the home. When the crisis is over, the patient returns to routine home care. When the medical symptoms or pain cannot be controlled at home, OpusCare can accommodate the patient at a hospital or other inpatient facilities to stabilize the patient before returning them home to routine home care. We provide a short-term accommodation to the patient in order to provide temporary relief to those who are caring for them. The patient can maintain their own physicians. An OpusCare physician is added to the Treatment Team to help as a specialist in controlling symptoms. Experts at maintaining the patient’s comfort, they assess the patient regularly and help family members by providing the necessary support. Coordinate community resources and help the patients and family with non-medical concerns, including but not limited to easing emotional difficulties and helping families /patients cope with end of life process. Help patients and family cope with spiritual questions and concerns at the end of life either directly or by coordinating services with the family’s personal advisors. 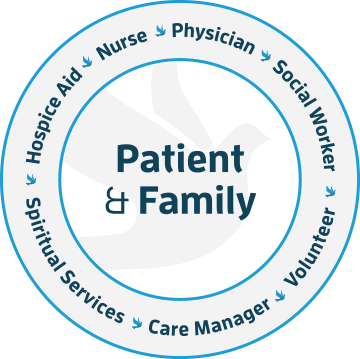 Provide ongoing support for the entire family throughout the patient’s hospice care and for at least a year after the patient’s death.